Sir Issac Newton was born in 1642 in Woolsthorpe Lincolnshire, England. He was a seventeenth century scientist. Newton was educated at Grantham Grammar school. In 1661 he went to Trinity College at Cambridge, he got his B.A. in 1665. From 1671 he was elected member of the Royal Society and became president of the Royal Society in 1703 until his death in 1727. In 1697 he became warden of the mint, and then in 1699 he became master of the mint. In 1705 he was knighted by Queen Anne. Newton was both a Physicist and a Mathematician. He came up with the idea of the law of gravity, from an apple falling from a tree. Newton conceived that a same force governed the moon and the apple he saw fall. He figured out the force needed to hold the Moon in it's place, as compared to the force of the apples fall. For this he also figured the centripetal force needed to hold a stone in a sling, and the relation between how long the pendulum and how long or short it swung. From this Newton got his Law of Gravity. 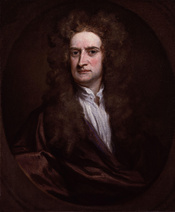 Newton also did a study on the nature of light and construction of telescopes. He found that rays of light would differ in color would also differ in refractablitity, in his study he also found that white light was a mixture of indefinitely varied colored rays, each ray definable by the angle through which it is refracted on entering or leaving a given transparent medium. He put this thought together with his study of the inference colored of thin films(like, oil on water or using soap bubbles), using a technique of extreme acuity to measure the thickness of such films. Streams of minute particles were found in the light. WriteWork contributors. "Sir Issac Newton" WriteWork.com. WriteWork.com, 14 August, 2001. Web. 21 Apr. 2019.